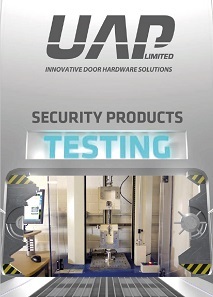 The UAP window lock (sash jammer) is a must have device for uPVC window security and even doors. It offers quick and low cost addition security to home security. 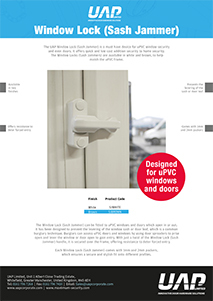 The window locks (sash jammers) are available in white and brown, to help match the uPVC frame. The window lock (sash jammer) can be fitted to uPVC windows and doors which open in or out. 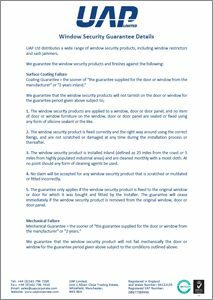 It has been designed to prevent the levering of the window sash or door leaf, which is a common burglary technique. Burglars can access uPVC doors and windows by using door spreaders to prise open and lever the window or door open to gain entry. With just a twist of the window lock (sash jammer) handle, it is secured over the frame, offering resistance to deter forced entry. Each window lock (sash jammer) comes with 1mm and 2mm packers, which ensures a secure and stylish fit onto different profiles.